February 28. 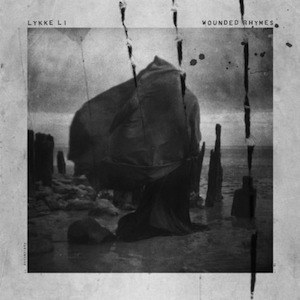 2011 | By Valerie C.
Swedish pop princess Lykke Li’s sophomore effort Wounded Rhymes will surely please many of her fans as well as fans of mild-experimental pop in general, but may leave some confused and wanting more. Listening to Wounded Rhymes has been a topsy-turvy journey for me. There are moments of edgy-pop brilliance but a few tracks, especially “Sadness is A Blessing” while it starts out promising, by mid-track left a bitter lyrical taste in my mouth. Thankfully those moments were few and far between. “I Follow Rivers” which Li says is about desire, lulled me into an almost dreamlike trance while the hypnotic drumbeats of “Get Some” moved my body against my will. The soft guitar strumming and beauty of Li’s voice on “I Know Places” succeeds in taking me to a melancholy place, enveloping me in its arms. The price of an artists’ successful debut is expectation. Sometimes expectation is rewarded positively where other times it’s a musical abomination. At first listen, Li’s Wounded Rhymes was just slightly above okay, but after living with it for several days my appreciation for the album grew.